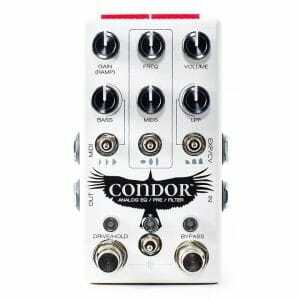 First up, the Condor. This pedal can do an awful lot. Whether its clean or driven tones you’re after, this versatile stompbox boasts a feather full of EQ controls including frequency controls via a parametric boost/cut where you can mould and shape how much of the midrange you want. This operates in a frequency range from 150Hz-5kHz. This is then further controlled by three Q settings. A bass boost/cut control with yet three more intensity settings, an LPF filter with three settings (normal, slight resonant & very resonant) and finally a ramping/hold function for control over LFO filter tremolo. Like all Chase Bliss Audio pedals, this also comes with the option to run your signal through the pedal either true bypass or buffered and pre set control via MIDI switching. 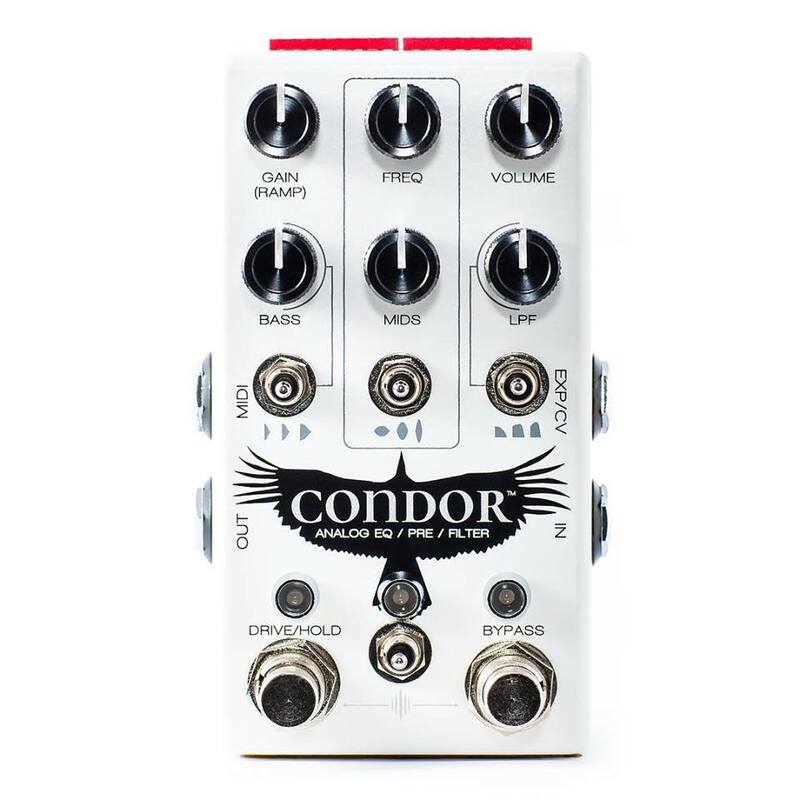 Keep your eyes peeled on the horizon, the Condor will be landing in stores in a few months time…. Inspired by the Greek bathhouses that began fifteen centuries ago, this Delay pedals effect is very wet. As said by the man behind Chase Bliss Audio Mr Joel Korte all dressed in bath robes (see video below), the Thermae is a “warm bath pedal”. The Thermae does much more than just delay, it has the capability to add layers of harmony and pitch shifting, creating a very smooth cascading effect as your repeats roll over each other. 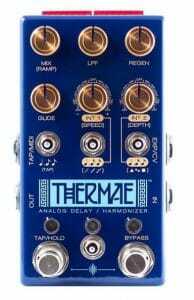 Powered by four reissued MN3005 bucket-brigade delay chips, the Thermae allows you to run many different delays and harmonising intervals at the same time. Overlapping like the hot water of a bath. Lovely. Utilising the Sequence mode, you can set cascading harmonies with two different Interval dials. Further dividing up these harmonies rhythms with two switches. One for each interval. Step mode -unlike Sequence mode- gives you those same divisions and intervals but gives you the ability to choose when they change via a specific footswitch. Giving you that extra element of control. 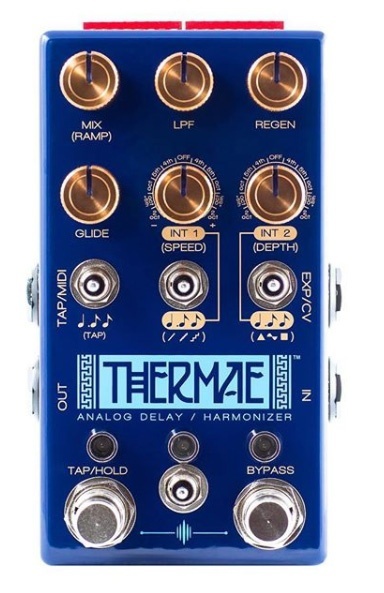 Additionally, the Thermae Delay has a Glide knob which controls how fast or slow one interval moves to the next. Not forgetting the Low Pass Filter, clever pedal. Both the Condor and the Thermae are expected to arrive in stores around Spring time. Listen below to hear the Thermae in action.